​We can only do small things with great love. 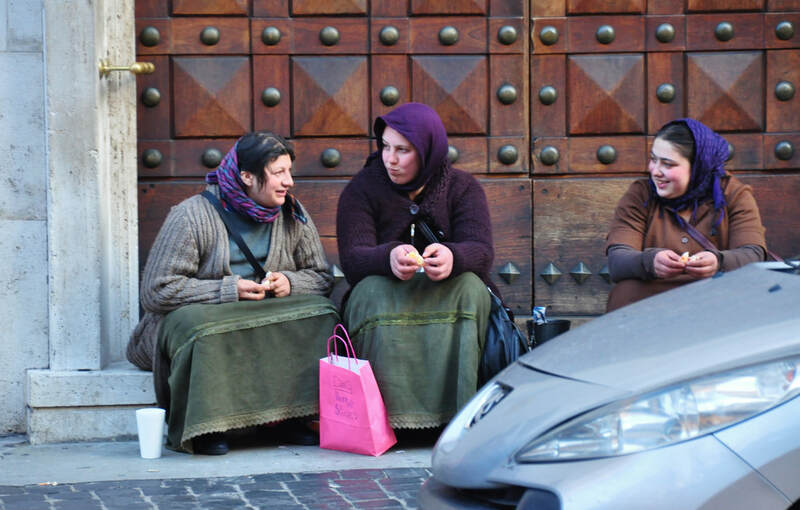 On the first day of our pilgrimage in Rome, we noticed that there were many homeless brothers and sisters. We felt really bad because we did not have anything with us to give them on that day. 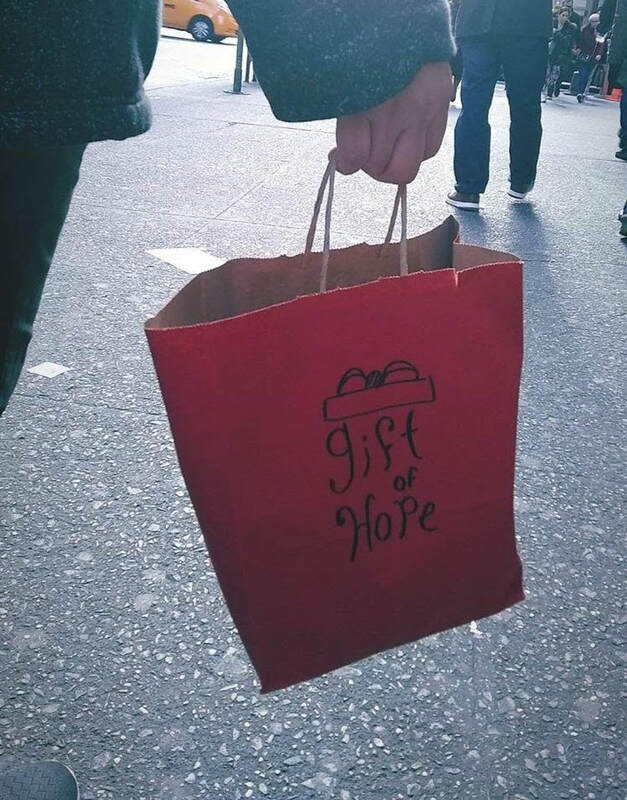 When we first started doing the “Gift of Hope” bags, we thought of doing it in every place we traveled to, but when planning our pilgrimage to Rome, we did not have a clear idea if we were going to do the “Gift of Hope” project. 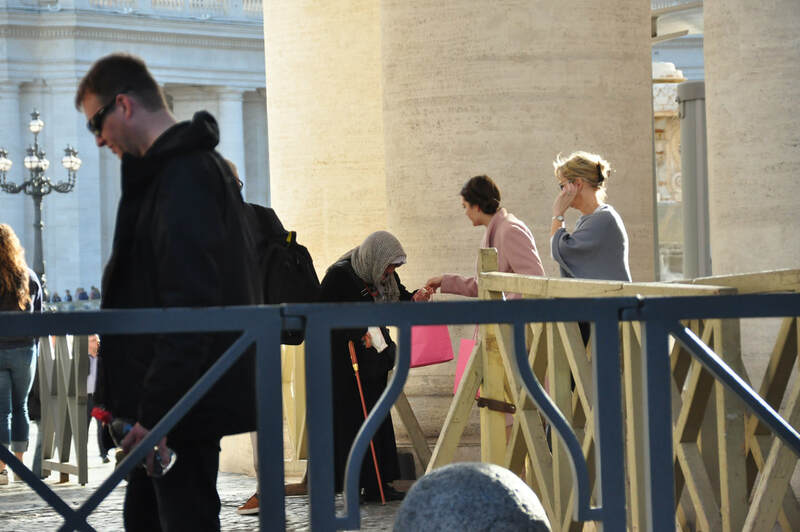 However, the idea became clear the first day in Rome, on our way to the Vatican, where we encountered several homeless people. "​Each one of them is Jesus in disguise." At the end of our first day, we went to the supermarket and bought some bananas and granolas bars. 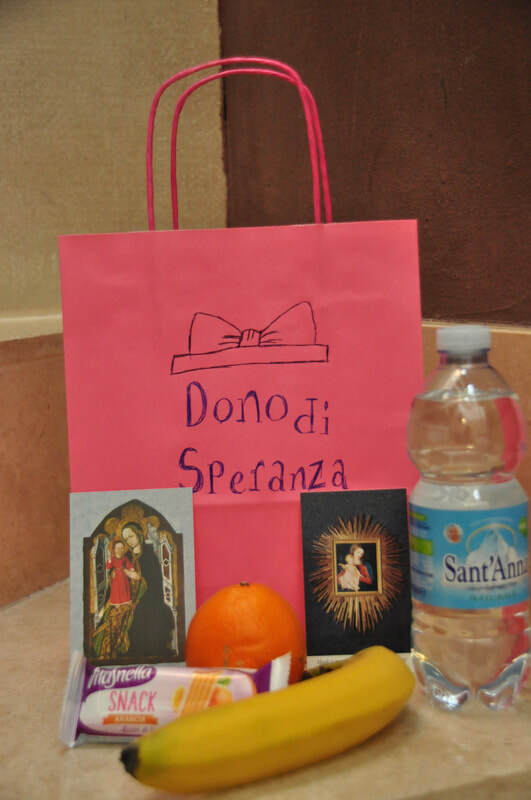 We also wanted to include a prayer card and another kind of fruit. Finding gift bags was a little bit of a challenge, we looked everywhere for them; until, we finally found a small store that looked like a 99 cent stores in the US. 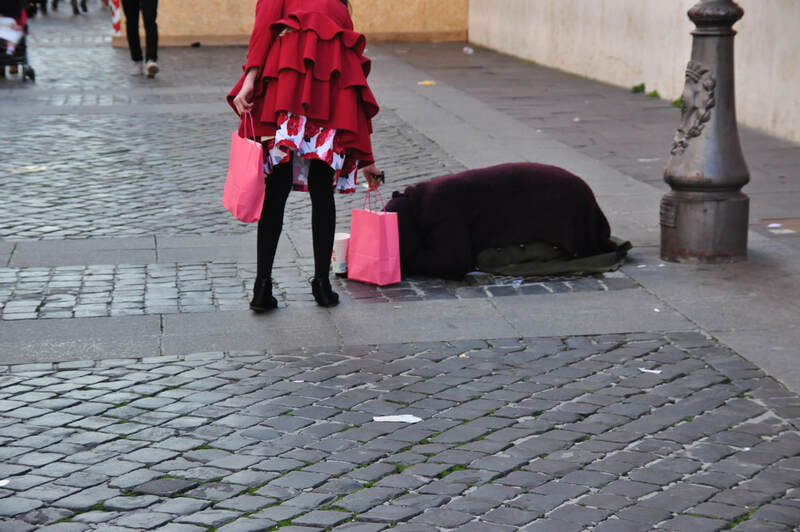 One homeless lady, was rolled up on the floor with her face covered, one of my daughters left the bag next to her. 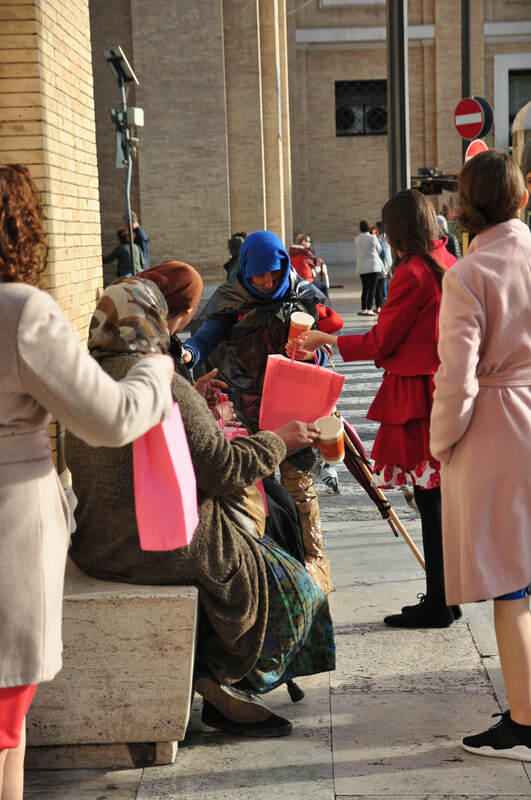 On the way back to our hotel, we took the same street, and to our surprise we noticed that the woman who we gave the bag to, was sharing the orange we had given with two other homeless women. Her generosity touched our hearts, it was wonderful to see that she was sharing the little bit she had with her sisters in Christ. Help one another with the generosity of the Lord, and despise no one. When you have the opportunity to do good, do not let it go by. 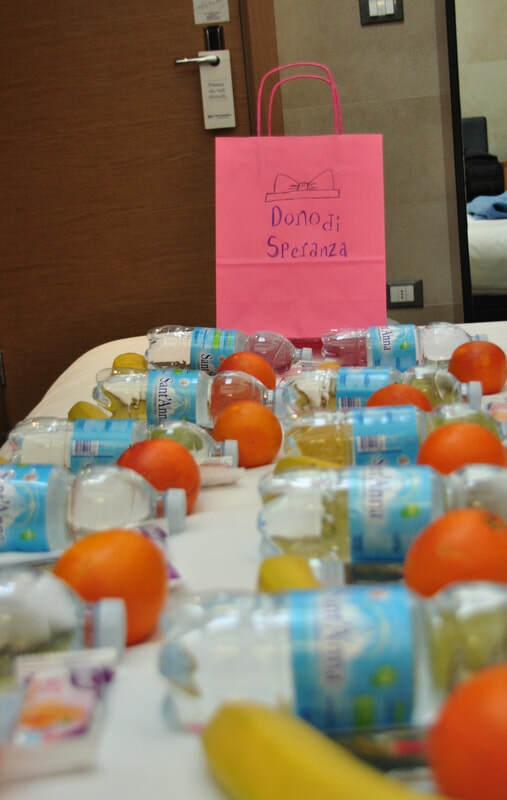 The following days in Rome, we brought a bag of bananas and oranges each day we went out and gave them to all the homeless people we saw. This experience was truly a blessing for us, we felt that we received more than what we gave. ​We wanted to share this wonderful experience with you in hopes that will inspire you to give a "Gift of Hope" to the poor around you. It has been in our hearts for a long time to do something for the people who are homeless or the poor. We really did not have an idea on how to start, until one day when we were watching a show on EWTN, "Real Life Catholic," Chris Stefanic the host did a special on the homeless in Denver, one thing that touched our hearts was when one of the homeless was being interviewed said to Chris that what hurt her the most was to be ignored by others. "People often just walk by me without even looking," she said. After watching the show, we were now inspired to do something about it. It was not clear yet on what we could do. A few days later, as I walked out of the supermarket, there was a homeless man, I almost walked past him when I remembered what the homeless woman had said to Chris, I immediately stopped and looked around my shopping bag to see what I could offer the man, I saw oranges and gave him one. It was just a little bit, I wished I could have done more. for one of the least brothers of mine, you did for me. After Mass, we went to buy the granola bars, hats, bags, got the prayers cards, drinks and our daughters started to assemble them while I cooked lunch. We made ten bags and after lunch we decided to drive to New York City because we knew that we would find at least ten homeless people to give the bags to. 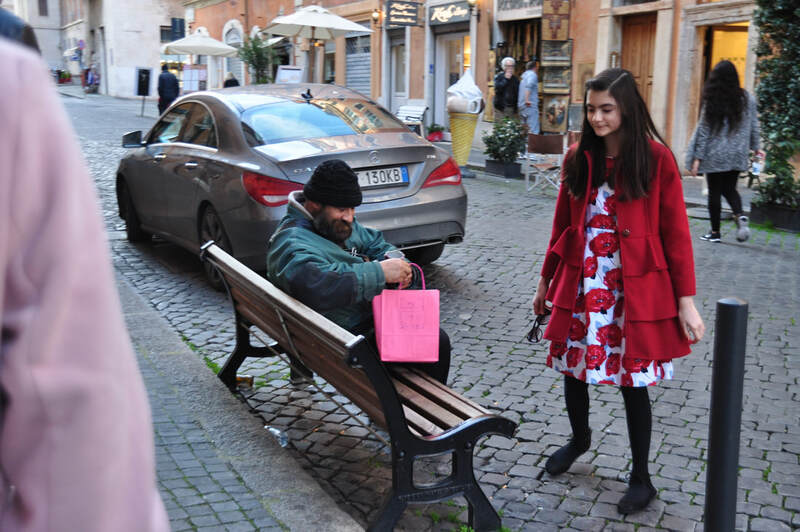 Even before we found a parking spot, Maria, our youngest daughter, saw a homeless man who was sleeping in the middle of the sidewalk, Brian got out of the car and left one of the bags next to him. 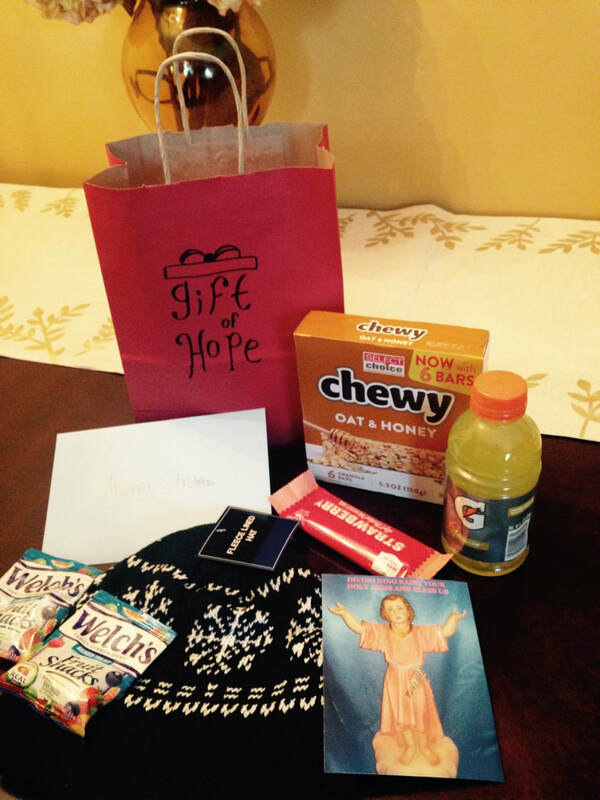 We hope that when he wakes up, he will be pleasantly surprised when he sees the gift. We found a parking spot next to Bryant Park and walked on 6th Avenue all the way to Rockefeller Center and found some homeless along the way. This time our eyes were open looking for "Jesus." As a family, somehow we always manage to make everything a competition, well this time it was no different, we started to compete who could find "Jesus" first. 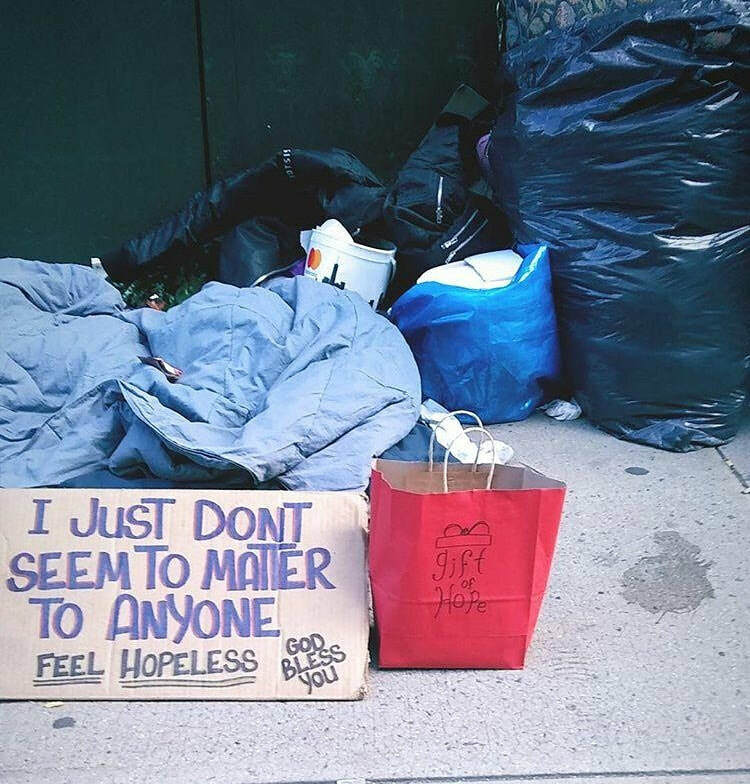 Coming back to our car, we walked along 5th Avenue and found a spot where a homeless had left a sign below. The person was not there, so we left our gift next to her/his belongings and we hope and pray that when she/he gets back they find a little bit of hope and realizes that God cares and loves them. Please pray for all of the people who have lost everything that they realize that God cares and loves them very much. Also, pray so that we can continue with this mission. 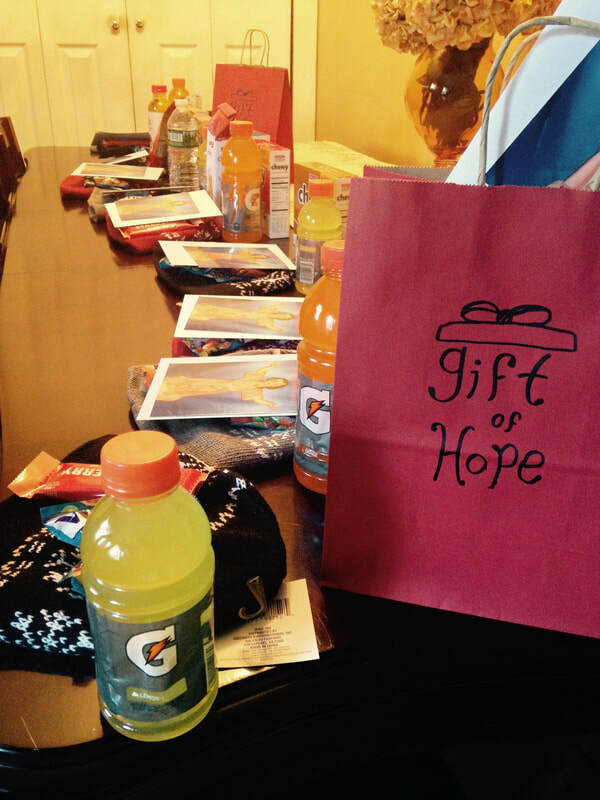 We hope that this will inspire you to do the same in your neighborhood, or give a "Gift of Hope" to someone who is home-bound, in a nursing home, a prison, in the military, or in a hospital.